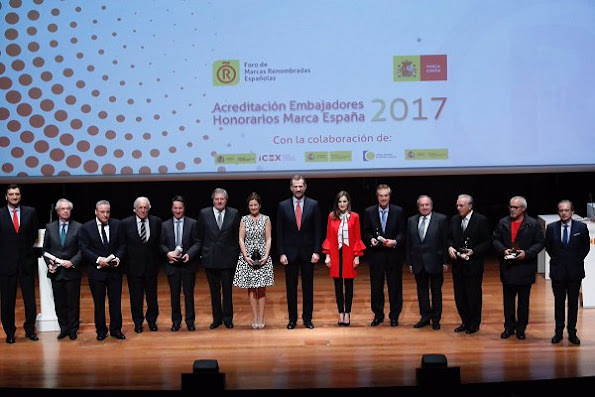 King Felipe of Spain and Queen Letizia of Spain deliver accreditations of the 7th edition of "Honorary Ambassadors of the Brand Spain" at Queen Sofía National Museum of Art (Reina Sofia Museum) on March 14, 2017 in Madrid, Spain. Queen Letizia wore ZARA Frilled Sleeve Coat and Roberto Verino Blouse. This isn't bad, per se... I really like all the pieces, but the coat and the blouse just don't play very well together. 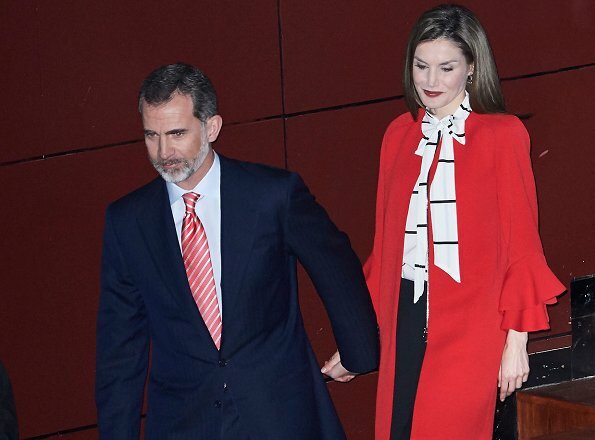 The King and Queen are such a handsome couple, though! 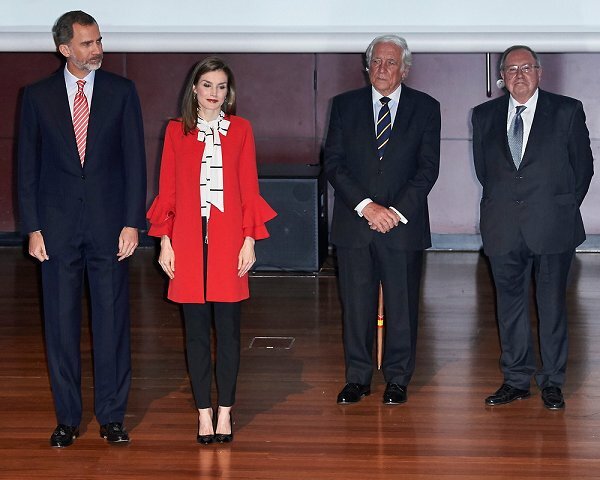 Colors are good, but the bow of the blouse and the valances of the jacket, that is too much. And I think it is too long, it should be worn as jacket, as on the model and not as a coat. 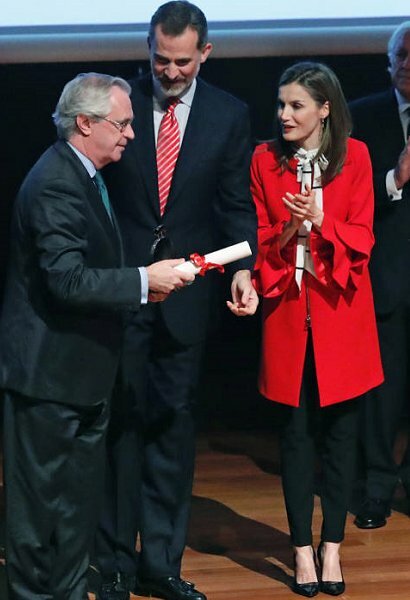 The coat, blouse and trousers do not go together. Too messy result! 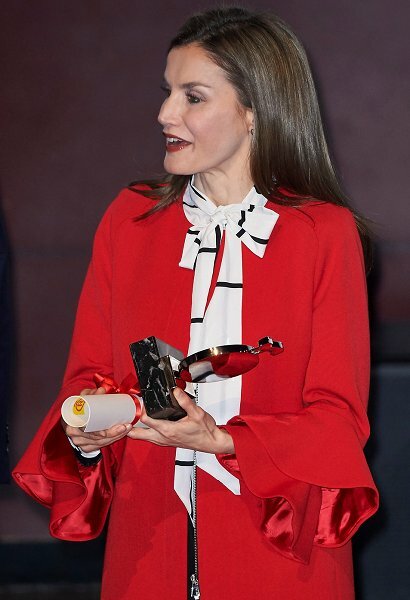 I am quite surprised that Letizia wears this kind of combo! Love the coat, particularly because is low cost. 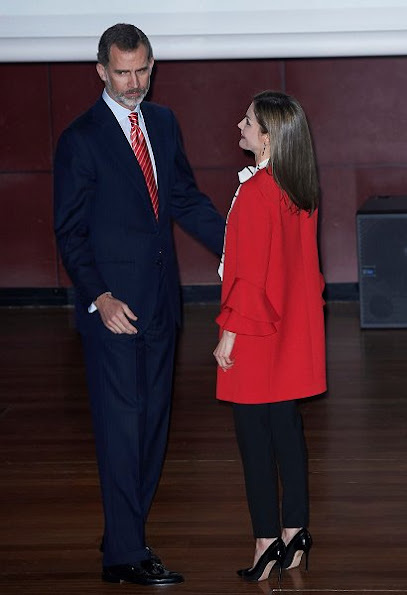 Red is her color and few wear the skinny pants like Queen Letizia. I find this to be a messy and fussy look. Too much going on with the sleeves and the shirt bow. Don´t like this ensemble, frills at sleeves are not good with that blouse bow. Coat is totally wrong style to suit her. Stunning!!! Her shoe collection is to die for!! Bonito abrigo, juvenil y luminoso. Letizia siempre se ve muy bien en rojo. The coat is too fussy for my liking.